From time to time, while reading familiar Scripture, I see something new in a verse or passage that I have never seen before…and it excites me. I become like a kid who finds a box of toys in the basement that they haven't seen in a long time and instantly begins playing with new vigor and imagination. That happened to me today while reading Matthew 10. "As you go, proclaim this message: ‘The kingdom of heaven has come near.’ 8 Heal the sick, raise the dead, cleanse those who have leprosy,[e] drive out demons. Freely you have received; freely give. 9 “Do not get any gold or silver or copper to take with you in your belts— 10 no bag for the journey or extra shirt or sandals or a staff, for the worker is worth his keep. 11 Whatever town or village you enter, search there for some worthy person and stay at their house until you leave. 12 As you enter the home, give it your greeting. 13 If the home is deserving, let your peace rest on it; if it is not, let your peace return to you. 14 If anyone will not welcome you or listen to your words, leave that home or town and shake the dust off your feet. 15 Truly I tell you, it will be more bearable for Sodom and Gomorrah on the day of judgment than for that town." There's a ton I could write here, but I'll stay on point. He is teaching them that apart from a divine (His) empowerment and provision, they would be left trying to work this thing out on their own with their own resources. So Jesus strips them of extra earthly possessions and securities. They had to trust that the path they were being sent on was both purposeful and safe by something entirely different from their personal experience or what their logical world would tell them. It's the next statement that got to me, “I am sending you out like sheep among wolves." Now wait a second. If I were to be honest, I don't much like that statement. If I were honest, I want nothing to do with wolves. I prefer others of the ovis aries family. At least send me among deer. If you really want me to be risky, send me to the baboons! I wish I could insulate myself from difficult people. Reality is that God sends us to people whom we would otherwise avoid. Jesus called it "sheep among wolves". The picture I saw in my mind was more like "cattle in a field of butchers". Idea…better be smart or you will get yourself killed. It takes faith. It takes observation. It takes courage. It takes control. And it takes the knowledge that there's a cowboy nearby for protection. What I realized today is that the resistance I feel toward the difficult people to whom God has sent me is the lack of faith I have in Jesus to work in and through me. I live in fear. Fear of feeling ill-equipped, incompetent or unwilling to even like "those" people. It will take supernatural faith, eyes, courage and control. Though I know this instinctively, it went beyond that for me today….I NEED the power of Jesus in me and through me. Time to surrender again. Here's some craziness that grasped me just now…what if the sheep comes to the wolves and attracts them enough to get closer to the shepherd…not so the shepherd will destroy them, but to transform them?! This morning I sit at a little shop in Canal Fulton, Ohio called Peace, Love and Little Donuts. These little cake donuts of happiness topped with sugary goodness make my mouth curl upward in a most delightful manner. Most who know me understand that I have four key weaknesses in my life that are separate from my love of Jesus. My wife, my kids, wedding cake, and donuts. This place has a great hippie feel and the people who run it are great! It's also fun to people watch here. I just overheard a lady at the counter say that she is enjoying this last donut before starting a cleanse tomorrow. Obviously she has never had one of these little fried circles of addiction. She does not know it yet, but she is in denial. She will be back in the morning. This I believe nearly as much as the resurrection itself. (insert hour and a half break from writing this post) I just got done speaking with this woman and her boyfriend. It was church around the table all the way. We pulled up a chair and processed Jesus a bit. Heaven on earth. Though I still believe she is in denial about tomorrow, I was privileged to get to know their story and can see a journey toward life in Jesus sometime in the future. I may even get a wedding out of it. Places like this help unleash a bit of my creative side and my spirituality side. Thank you Peace, Love and Little Donuts. As 2014 is now upon us, I have done what many do; look at the big picture of life, break it down into segments, and set goals. Early last year God gave me the vision of Church Around the Table. Looking at the big picture of my life, I wondered if I should put CATT on the shelf for the next year and focus on some specific needs of the family. My circumstances said it would be a good idea but my spirit said, "No way!" A vision from God is a sacred thing. I cannot treat it with contempt. It may be slowed down, but it cannot stop unless God speaks something different. Think about it from a Biblical perspective. Whenever a vision or a task was given by God it was usually met with circumstantial obstacles. Abraham had Pharoah's interest in his wife to contend with, Moses a desert, Elijah a wicked queen, Nehemiah had leaders of surrounding countries threatening his work, Jesus had the cross, and Paul shipwrecks. In times when things don't go the way you believe they could or should, it doesn't change the assignment. The one thing we do see change is the leader. That is faith development. I press on because certain facts remain. Fact: people need to have conversations about faith. Fact: many need to have them with people they trust through friendship. Fact: most followers of Jesus I know don't know how to do that with people in their lives even though they want to. So I have set a goal. 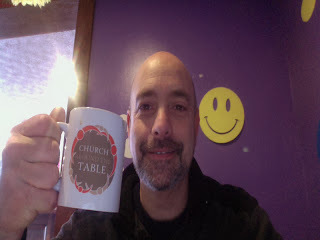 Be it by serving in a church setting, continuing to flip cars and sell Juice Plus, or any other pathway, I will (and my family will) continue to develop Church Around the Table as way to get the gospel of Jesus Christ processing in the lives of every person whom God chooses to use in this model. We ask for your prayers in 2014 as we walk forward in faith to do what is God's work for our family. Over the last eight months our family has been on a journey. Some of it has been good and a bunch has been a time to learn and grow. Here's the nutty journey in a nut shell… In February of 2013 I received from God a picture of "church" from a different angle. I never saw it as any better than other methods, just different and easily transferrable to any culture on Earth. My wife and I came to call this picture "Church Around the Table." The idea is simple…look at the different worlds God has put you in (home, neighborhood, workplace, school, etc…)and invest all your resources into those worlds. Since your time is already invested there, also invest your heart, intellect, spirituality, and finances into the people in those worlds. Allowing your faith and life to line up in those worlds makes you a powerful disciple of Jesus. The common entity in each of those worlds is the concept of the meal table. If not around an actual table, we consistently share life with others. When when we are trained to process our faith with those we are sharing life with, we are fulfilling the commands of Jesus to love God and our neighbor as ourselves. Shortly after receiving this picture my service as Sr. Pastor at a church ended. Seeing this as an opportunity to develop the vision, we began to make choices we believed would allow us to fulfill the vision more quickly. After six months it became clear that our path was not working out. Perhaps that was the case…or we were allowed to follow that path to discover new things about ourselves which will prepare us to better serve others. Time will tell. We now stand with hands and hearts wide open to follow Jesus wherever He may lead. The vision will continue to develop, be it here in Ohio or somewhere else. Perhaps it will happen through a traditional church that is ready and asking to do some things differently or it will happen in our lives as I sell cars. We are happy no matter what the outcome because the point is not to be successful. The point is to love God and love others as ourselves. For more infö on "Church Around the Table" go to our website, www.churcharoundthetable.com. While riding the bus to our job site one morning this week I overheard a pastor from Atlanta and a youth from Poland discussing their families. Youth: So where is your mother? Pastor: Well she’s not here she’s in heaven. Youth: Where in America is that? Pastor: (Gesturing Upward) Not here, higher, higher. If only heaven were a place in America called Ohio we would all be much better off. Even Arizona could relax because everyone would just be passing through on their way northeast. 1) In Poland sales tax is built into the prices which means you actually know how much cash to pull from your wallet before you get to the checkout. 2) Poland has castles. Big ones! Sorry Alliance. 4) In Poland houses last longer than mortgages. Houses here appear to be built to last several hundred years rather than just 25 years like the ones back home. 5) In Poland you don’t have to mow your lawn because nobody else does. All that being said Ohio is currently the closest thing to heaven that my mind can conceive of. So I have compiled a list of four reasons why Ohio is better than Poland. I miss you ladies and can’t wait to see you again! Back home, there are many daily used items that I give little or no thought to in terms of availability and convenience. Toilet paper being one of those items. When the need arises, I can be quite confident that upon entering a restroom (or water closet as they call it here in Poland), that a soft, 2-ply roll of the white stuff will be conveniently awaiting my use. So, you can imagine my confusion when upon entering my dormitory in Lodz, a roll of toilet paper, among a few other necessities was issued to me. I must admit, I gave it little thought until that evening when I crept out of my room to the restroom only to realize that I had forgotten my precious toilet paper behind. I will spare the details of how I managed that situation...suffice it to say that resourcefulness should be seriously considered among the fruits of the spirit! After that it was every woman for herself, and the toilet paper in the dorm soon became cotton gold! Funny how that first evening I complained (within my inner dialogue of course) about the lack of such a “necessity”. I may have even verged on a small pity party. Until the next day. We were divided up into teams and sent out to serve those in need. Upon meeting some of those people, hearing their stories and witnessing the extreme poverty in which they lived, I quickly reaccessed all that is truly sacred in life. These “people in need” included orphans, widows, alcoholics, the mentally challenged, the physically impaired, and various others that have experienced more unfortunate circumstances than one can comprehend. Their living situations were seemingly hopeless... and yet the scripture that my mind recalled over and over was “the light shines in the darkness, and the darkness did not overcome it.” It was like walking inside a house on a bright sunny day...at first the darkness is overwhelming and you cannot see through it. But as your eyes adjust, you see things more clearly and can proceed forward. These people have been merely surviving in the darkness, and what I witnessed over the week the most penetrating light through acts of sincere love that I have ever had the privilege of seeing. Hope came in a tangible way to these precious people. Seeds have been planted, kindness was extended, and love in Jesus has been shown. My hope is that these people grasp onto the light and hope of Christ. Because I know with certainty that once they do, they too will shine in the darkest corners of the earth. Back to my issue with the toilet paper (which I have since learned is NOT a necessity)...next time someone asks if I can “spare a square”... I will gladly do so , knowing that I MUST share all that is sacred within me.... my faith, God's love, and yes...sometimes a roll of the fluffy white stuff! Cup of Joe » What's Brewing? Get the Cup of Joe » What's Brewing? widget and many other great free widgets at Widgetbox!